Feline hyperthyroidism has been on the rise in the last few years. No one is sure if it is because cats are living longer, or if it is because we just know more about what symptoms to look for. Hyperthyroidism usually strikes cats over 10 years of age. Symptoms include weight loss with a normal or excelled appetite, hyperactivity, diarrhea, heart murmur, and sometimes vomiting. A blood test called a T4 measures the thyroid hormone level and will usually tell if the cat is hyperthyroid or not. We always run a complete blood profile to check for any other problems that may be occurring at the same time. If your cat is hyperthyroid, you will need to recheck the T4 every few months until your cat is stable and then periodically to ensure proper control. There are 3 ways to treat hyperthyroidism: daily medication, surgery, or radiation therapy. Daily medication, called Tapazole® (methamizole), can be prescribed for your cat. This is given twice a day and is the most common treatment for cats. Surgery consisits of actually removing the thyroid gland. Radiation therapy is highly recommended. This is a very good option for cats that are hard to pill. The doctors at Ohio State or MedVet, here in Columbus arew set up to do this and have had good success with the protocol. 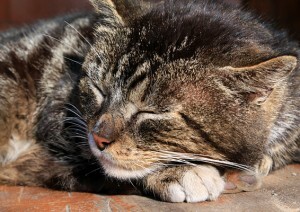 If you have any questions, or suspect that your cat may be hyperthyroid, please contact us.